A field pattern is a representation of electrostatic, hydrophobic and shape properties – the ‘protein’s eye view’. Field points are a condensed field pattern that make fields computationally viable. Fields rely on an accurate and detailed description of atoms in molecules. Traditional technology uses simplified descriptions that are not accurate enough to provide high quality field patterns. Cresset uses fields invented by Dr Andy Vinter while working at Cambridge University and as a consultant to the pharmaceutical industry and then developed by Cresset. Their method relies on Andy’s XED models of atoms and molecules, which present a more complex, accurate description of the charge around any atom. 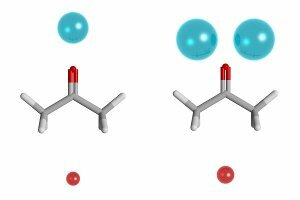 Using the XED model of atoms the field points around even simple molecules such as acetone (below) become richer and more informative, here showing the lone pairs of electrons that are present on the oxygen atom. Left: The incorrect field pattern on acetone generated with a traditional approach. Right: The correct acetone field pattern generated using Cresset’s XED model of atoms. 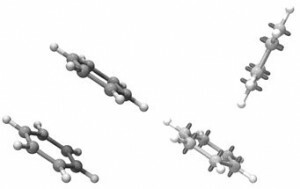 The XED model of atoms and molecules gives improved field patterns but also gives a significantly improved description of intermolecular interactions. For example the interaction of aromatic groups, a common interaction in protein-ligand complexes is correctly predicted by the XED model to prefer an edge to face arrangement (below right) where traditional technology incorrectly suggests that a face to face arrangement would be preferred (below left). The net effect is to more accurately model protein-ligand complexes leading to better understanding of activity or off-target effects. Left: Benzene-benzene interactions as predicted using traditional technologies incorrectly suggest face-to-face interactions. Right: Benzene-benzene interactions correctly predicted as edge to face using the XED model. Cresset’s academic collaborators have used the XED model to study and predict specific intermolecular interactions. For example Professor Chris Hunter studied the dimerization of a series of di-aryl amides (left) using NMR and computational chemistry. He found that the XED model accurately predicted the experimentally observed association constants (right). This technology is based on the scientific developments of XEDs and fields made by Dr. Andy Vinter whilst at the University of Cambridge and working as a consultant to the pharmaceutical industry. Cresset continues to update and improve the XED force field. For more information about the features and latest releases, see XedTools.